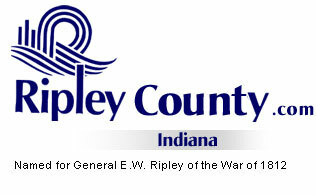 The Ripley County Council met on January 22nd, 2008 at the Ripley County Annex in Versailles, Indiana. Donald Dunbar, 2007 Council President called the meeting to order promptly at 7:00PM with the pledge of allegiance to the flag. Council Members Dephane Smith, David Simon, Ben Peetz, Juanita Kaiser, Donald Dunbar and Mark Busching were present for the 1st meeting of the year. Council Member Armbrecht was not in attendance. Council Member Kaiser made a motion to approve the minutes for the December 17th, 2007 meeting seconded by Council Member Simon. Motion approved unanimously. Council Member Kaiser made the motion to elect Dephane Smith as the 2008 Council President seconded by Council Member Simon. Motion approved unanimously. Council Member Smith made the motion to elect Donald Dunbar as the 2008 Council Vice President seconded by Council Member Simon. Motion approved unanimously. Council President Smith thanked her fellow Council Members for their vote of confidents. Council Member Peetz made a motion to approve the additional appropriation for $1,965.23 Acct# 621-43101-000-621/Tarter Grant -Park Benches for the Ripley County Park & Recreation seconded by Council Member Kaiser. Motion approved unanimously. Council Member Busching made a motion to approve the additional appropriation for $10,506.68 Acct#508-32770-000-052 /SISWD –Dumpsters for the Ripley County Highway Department seconded by Council Member Kaiser. Motion approved unanimously. Council Member Kaiser made a motion to approve the additional appropriations for $5,000 Acct#282-43500-000-282 and $3,000 Acct#282-11600-000-282 Clerk’s Perpetuation Fund for Ginger Bradford, Ripley County Clerk seconded by Council Member Dunbar. Motion approved unanimously. Council Member Kaiser made a motion to approve the transfer of $1,000 from Acct# 100-32400-000-020 to Acct#100-37800-000-020 and $11,252 from Acct# 100-19300-000-020 to Acct# 100-37800-000-020 for Circuit Court Judge Carl Taul (to pay for contractual service for the Jefferson & Ripley County Child Advocacy Program) seconded by Council Member Simon. Motion approved unanimously. Auditor McCoy advised the Council Members that per the state we were not able to reimburse the county the $900,000 from the Family & Children on the Form 22. The Transfer form is used as a courtesy to show that it is being reimbursed to the County General. Council Member Peetz made a motion to approve the transfer of $900,000 from Acct#248-99999-000-248 Family & Children to reimburse the County General (for the loan given to the Family & Children) to Acct# 100-99999-000-000 County General seconded by Council Member Kaiser. Motion approved unanimously. Tom Grills, Ripley County Sheriff updated the Council Members on end of the year reports on the Jail, Commissary Fund and the Jail Inspection Report. Grills requested that in future he would like to have a nurse on duty approximately 30 hours a week and some part time clerical for the Jail. Grill also requested $845 be paid out of the Misdemeanant Fund to benefit the reserves in their diligent work to the office and a budget for Home Incarceration/Work Release Fund. Council Member Dunbar made a motion to table Grills requests until the next meeting (due to not advertised) seconded by Council Member Peetz. Motion approved unanimously. Katherine Taul, Ripley County Tourism Director presented Council Members the 2007 Annual Report and the 2008 Tourism Budget. Commissioner Folz updated the Council Members on the Humane Society. Council Members decided to meet on Tuesday, February 19th, 2008 for the second meeting in the year and at that time decided on the meeting schedule for 2008. Council Member Busching made a motion to appoint Bob Gindling to the ABC Board seconded by Council Member Kaiser. Motion approved unanimously. Council Members signed the membership certification appointing Dephane Smith as a voting member of the Southeastern Indiana Regional Planning Commission until December 31st, 2008. Council Member Peetz made a motion to keep the committees as in 2007 except for David Simon as EMS Committee person seconded by Council Member Kaiser. Motion approved unanimously. Council Member Peetz made a motion to adjourn until the next meeting on Tuesday, February 19th, 2008 seconded by Council Member Kaiser. Motion approved unanimously.